In sci-fi and fantasy writing, worldbuilding is key. A well-crafted world and setting is what makes your otherwise nutty ideas believable. Things have to hold together. Laws, history, and ecosystems all affect your characters. It’s not just about giving people somewhere to live… it’s about shaping something that becomes the very canvas you’re working on. I love worldbuilding. It can be hard work, especially when you’re setting up something vast or radical. Details are like dominoes – they directly affect each other, creating new details and offshoots of ideas. Sometimes they get hard to juggle. Every so often I’m reminded that the very best source of inspiration when crafting a new world is the one we live in right now. Whether you’re looking at past conflicts or politics, religions, fashions, technology, or my personal favourite, nature, you can find something that gives you a fresh idea or highlights an important detail you’d overlooked. That is an animal. A real, existing creature. Look at those colours! That shape! That iridescent beauty! This is the rather unfairly named blue sea slug. Not only is it stunning to behold, it’s got some pretty awesome behaviour traits too. It floats upside down in the sea, being transported by ocean currents. Its primary food source is the Portuguese Man-of-War, that jellyfish of the vicious stings. Not only does it eat the Man-of-War, it actually takes its prey’s stings and stores them to use for its own defence. A spectacular little creature. So spectacular that the first time I stumbled across it, I thought it was a hoax. But nope. It’s real. Its Latin name is Glaucus atlanticus. 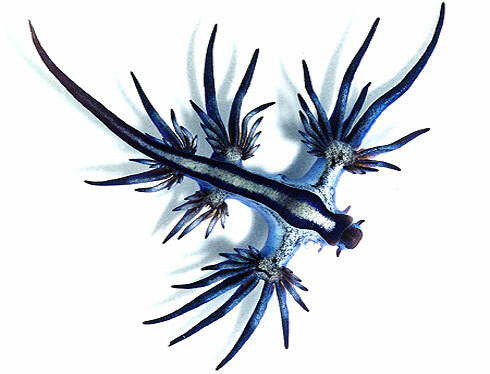 So if Glaucus atlanticus can exist, surely the possibilities for your own world are endless?